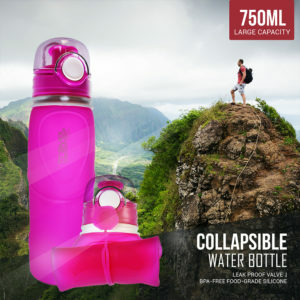 In case you’re worn out on paying $10 for a container of water each time you fly outing, attempt a lightweight, collapsible water bottle that you can stuff into your pack and afterward refill once you move beyond airplane terminal security. 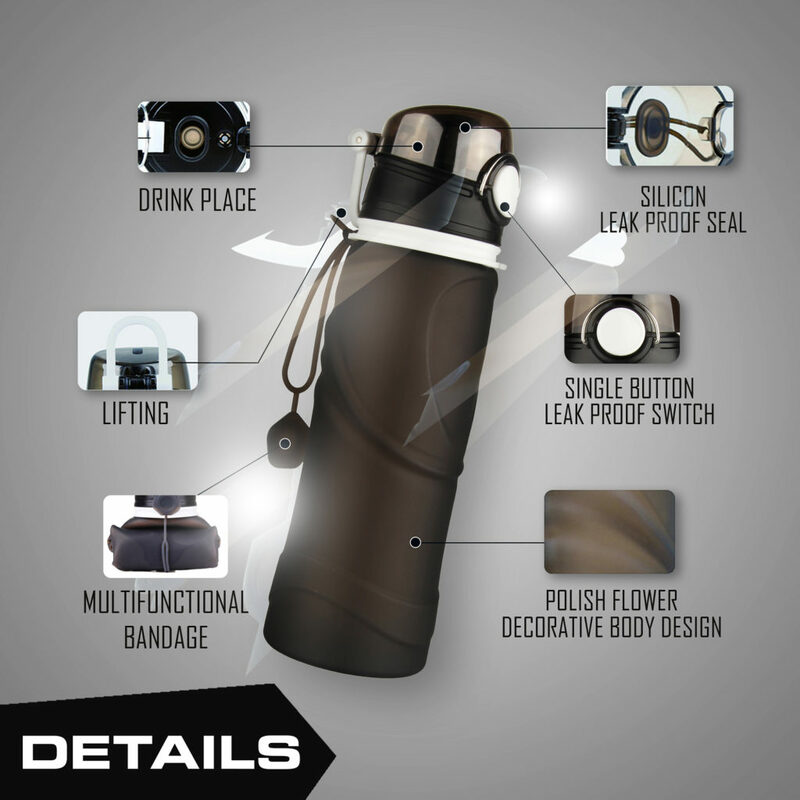 We found that the Travel Gadgeteer Collapsible Water Bottle is the best collapsing bottle for a great many people. This airtight jug holds a sensible measure of water, and contrasted and the majority of the other collapsible jugs we tried, it provides a drinking experience that feels closest to sipping from a rigid bottle. 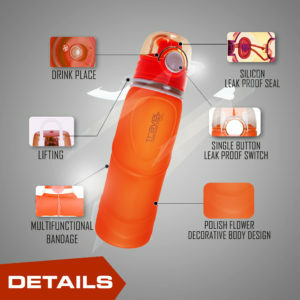 Collapsible Water bottle with extra-large capacity of 750ML while still small enough to grip in one hand. 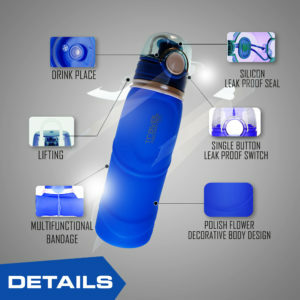 This water bottle has a newly designed spill-proof valve water comes out when squeezing, special design for collecting air. It is made up of high quality Medical grade silicone material. Product is fully collapsible and rolls up nicely for stowaway, making it a perfect travel accessory. Can be easily cleaned and washed due to wide opening. It is even machine washable in top rack. 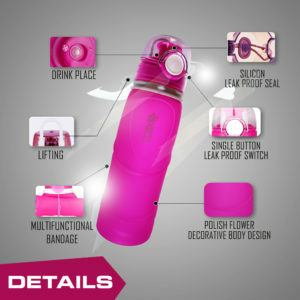 This unique water bottle looks great, is super convenient and holds a lot of water. 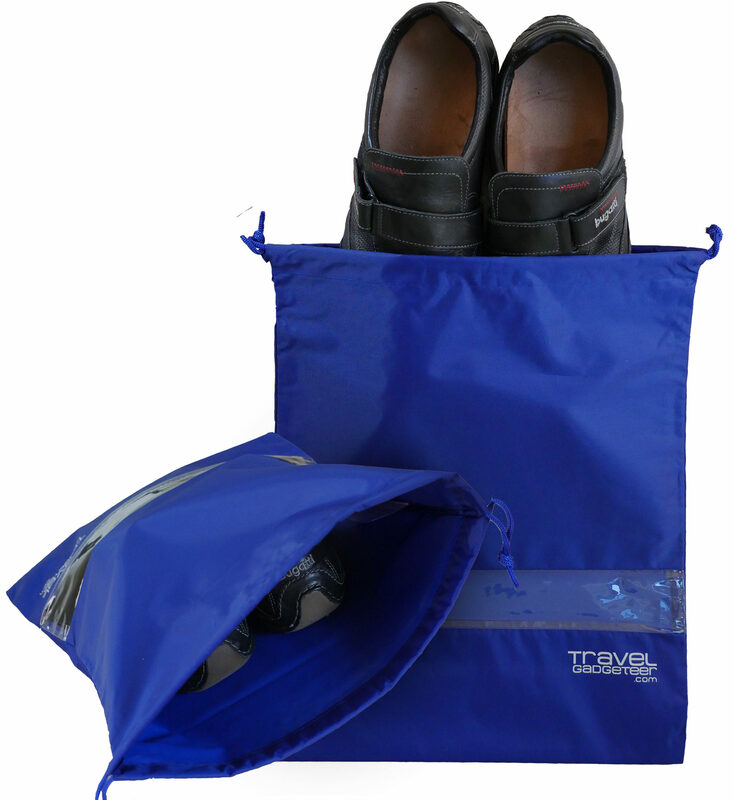 These shoe bags were specifically designed to be durable and provide lasting storage. Tough Enough to Protect Your Shoes from Scrapes and Scuffs when Traveling (2 Burgundy, 2 Blue, 2 Black). With the see-through window you will not have open each bag to find the pair you are looking for. Great time saver. These Shoe Bags are Equipped with a 2 sided Drawstring so that Your Shoes Stay in the Bag and the Dirt Out of Your Luggage. Water Proof Woven Nylon Fabric Material is Designed to Keep Any Residue from Streets Away from the Rest of Your Belongings. These Bags Accommodate Larger Shoe and/or Items | 13 x 16 in. (33 x 40.5 cm) – Can Fit a Pair of Size 11.5 (US) or Size 44 (EU) Dress Shoes Side-By-Side – Although Best Option May Be Soles Facing Outward. Perfect shoe bag for golf, camping, athletic bag, and storage to keep items dust free in your closet. 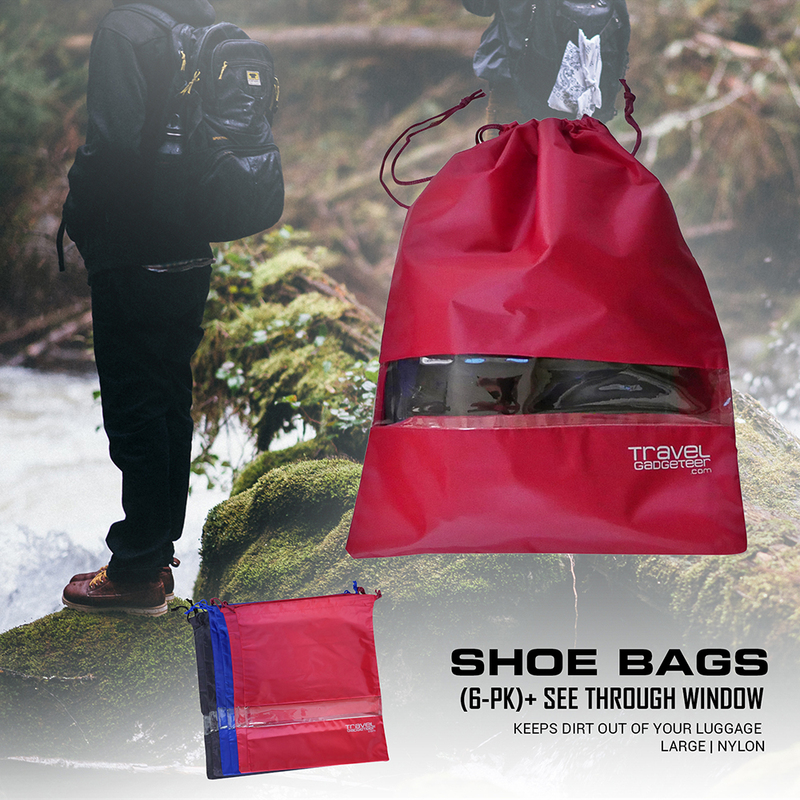 6 High Quality Waterproof Nylon Shoe Bags that will fit 6 pairs of shoes. Essentials for TRAVEL &BUSINESS： Large capacity, they can used for organizing your shoes to keep away from moisture, dust and bacteria. 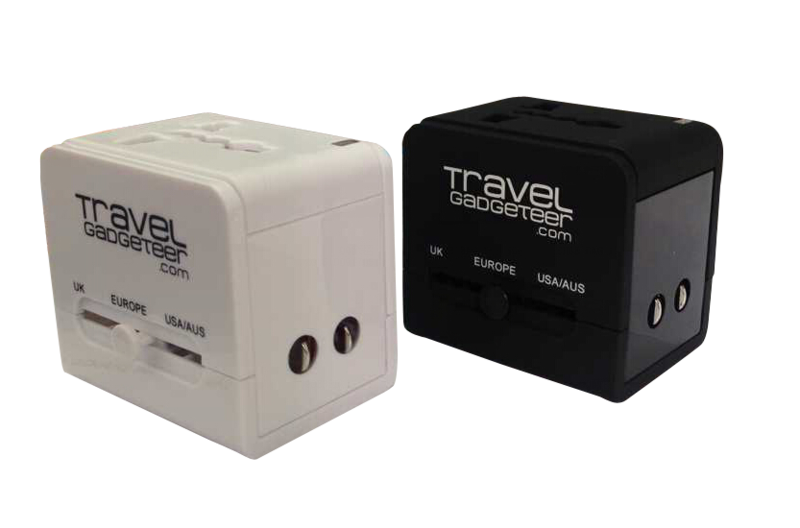 Making your travel easy. High-performance fabric resistant to abrasions, tears, and scuffs. REUSABLE AND MULTI-PURPOSE. 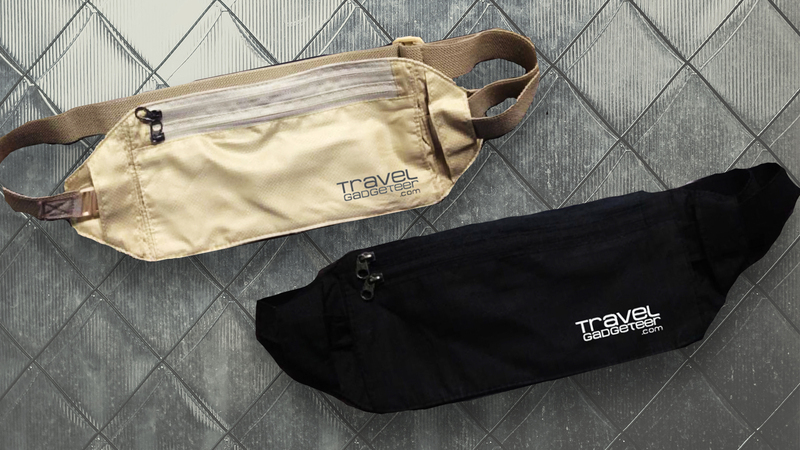 Money Belt by Travel Gadgeteer. 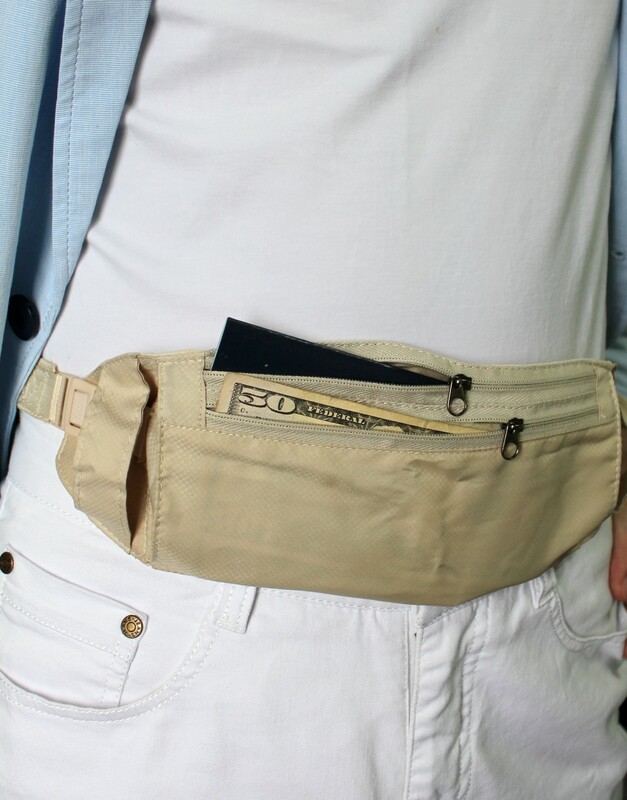 Money Belt for Travel that can be Hidden under Clothing for Safety. Whether you are traversing the US, having entry to your imperative reports and cash is crucial, however numerous travelers give almost no idea to the security of these records – until they are stolen by a smooth fingered pickpocket or shrewd criminal. Having your wallet as well as identification stolen on a travel, particularly abroad, can put a major mark in a voyager trip, particularly when you figure in the time and patience dealing with replacing stolen documents. The easiest way to avoid this dilemma is to purchase a travel wallet/money belt and consistently use it. 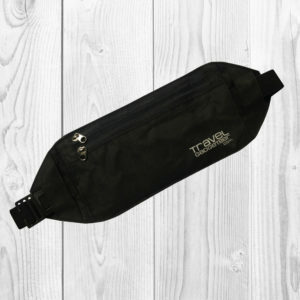 This money belt with two pockets that zip closed, will not only keep your valuables more secure, it will also allow you to keep important travel documents separate from the items you will need to access more often, such as cash, credit cards, and travelers checks. 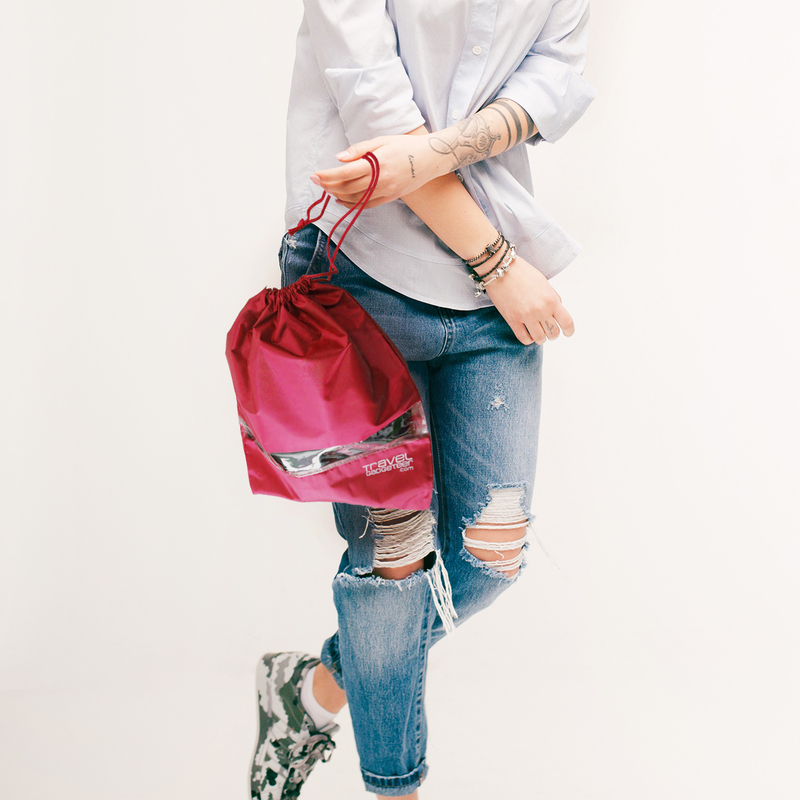 Made of lightweight soft polyester, this fanny pack is so slim it forms to your body. This allows the money belt to be worn between your outer garment and underwear, with its top below your belt line. Quick release clip with fully adjustable elastic strap that fits up to maximum 60 ” waist. When worn as a waist pouch, it’s the best secret travel pouch for you to wear. Machine washable. Wash in warm water, hang dry or use dryer on low setting. 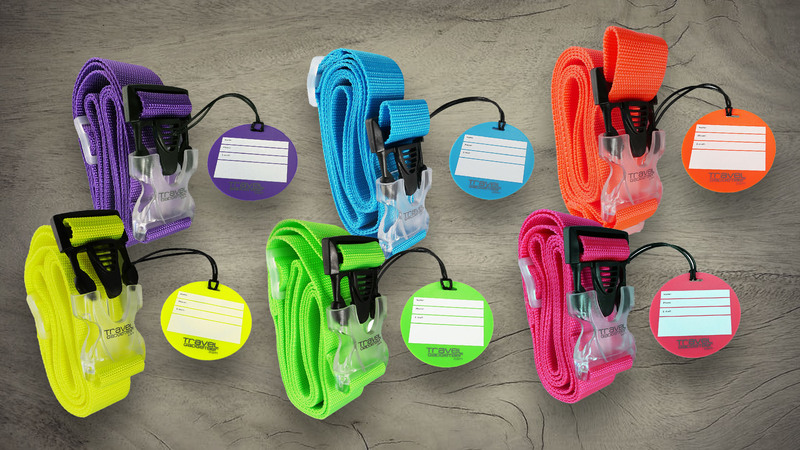 Quick release clip with fully adjustable elastic strap that fits up to maximum 60 ” waist. Smooth, lightweight polyester with extra soft backside material. This fanny pack is slim and forms to your body. Luggage Strap and Tag by Travel Gadgeteer. 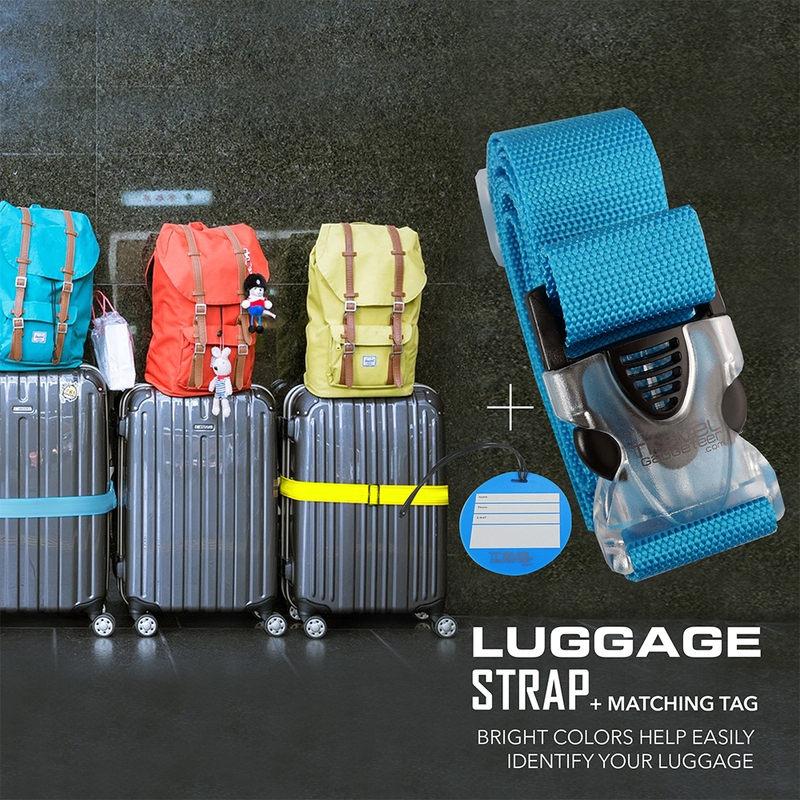 A Personalized Accessory for Easy Baggage Identification and Security. Not much has changed worldwide with electrical standardization. Your expensive electronics could be seriously damaged when traveling to other countries. 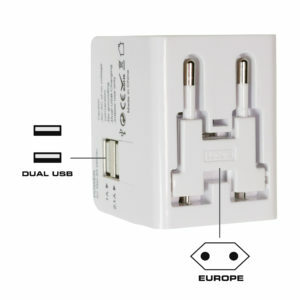 When traveling in another country or multiple countries you usually will need an international travel adapter plug. This power adapter travel plug fits that need. Laptop, Phone and Tablet can be Charged all at the Same Time. There is a fuse built-in 6A 250v and safety shutter to keep tiny fingers safe. Short circuit protection, when fully charged it will stop automatically. Only one plug can be pushed out at a time. Built-in multi-nation plugs can be selected to fit electrical outlets in 150 countries (US/EU/AU/UK). USB Max. 3100mA 5V DC. Suitable for Android, IPhone, IPad, Tablets, etc. LED charging status indicator, AC Max. 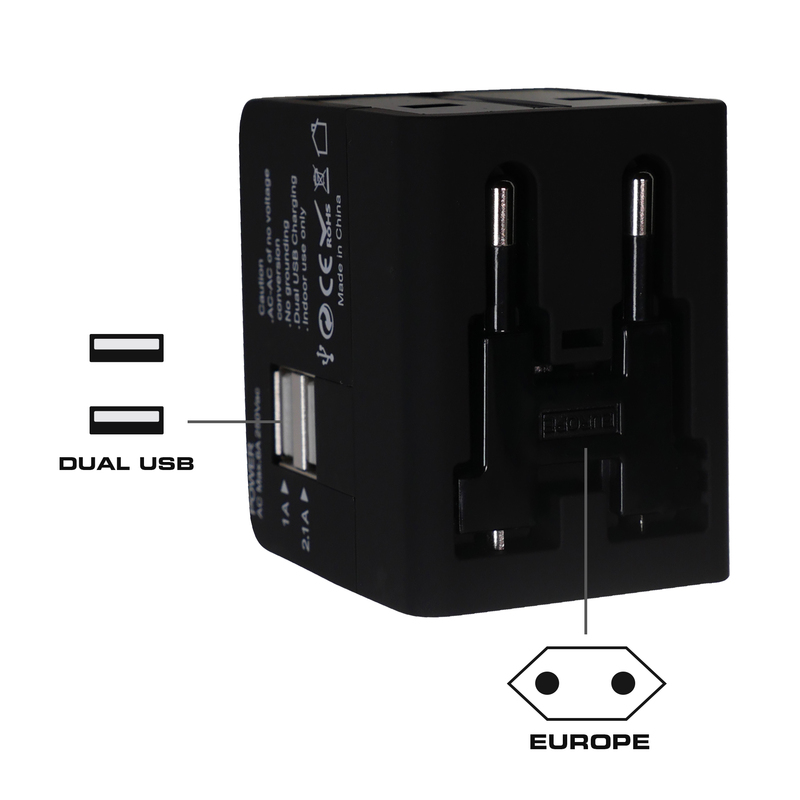 6A 250V AC.